If you follow me on Pinterest you may have seen this pin last week sometime. 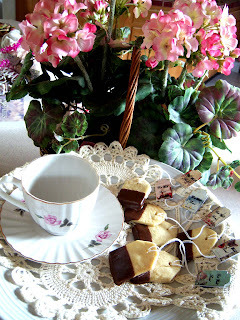 I absolutely loved those little tea bag cookies and knew I wanted to make them for some of my tea loving friends sometime. Well, today is the 1st of several tea related posts I'll be doing -- in preparation for Mother's Day and a tea-related gift I'm giving to my mom. In a bowl, beat butter until smooth and creamy. Add sugar and vanilla and mix till smooth. Gently stir in flower mixture just until incorporated. Cut rectangles and then snip off top edges to give the "tea bag look"
Place on baking sheet (lined with wax paper). Poke hole for string with a toothpick. Bake in 350 degree oven for 8 to 10 minutes. When chocolate dries, Thread string through hole in cookie. Serve at your next tea party or gift to a friend! 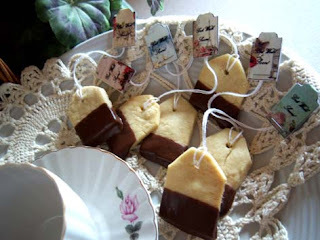 I'm including several FREE tea bag tags to tie on your cookies. How LOVELY!! thank you for the tags and the sweet idea. This is an amazingly delightful idea! Thank you so much for the free tags! Great idea : ) Thanks for the recipe!!! You probably heard me squealing from NYC when I saw those cookies.I can't wait to try them.I collect teapots, and teacups and have tea parties with my nieces. Thanks for sharing the recipe..Can't wait to try them. Oh yes! I did see this on pinterest and thought it was so sweet - except I'm not supposed to be eating such things anymore. Drat! Thanks for this idea, though. Perhaps I can do something that is tea related and not quite so stressful on my digestive track! Glad my roof raising blessed you - more to come on that on Pink Saturday. 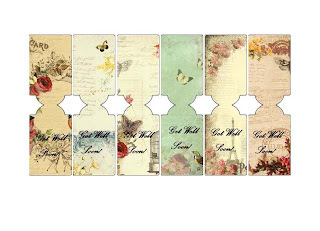 These are just SO cute, Esther. Great job. I love it when I see a great idea and then make it a reality for myself as well. It's so satisfying. These will make a great treat for gift-giving. 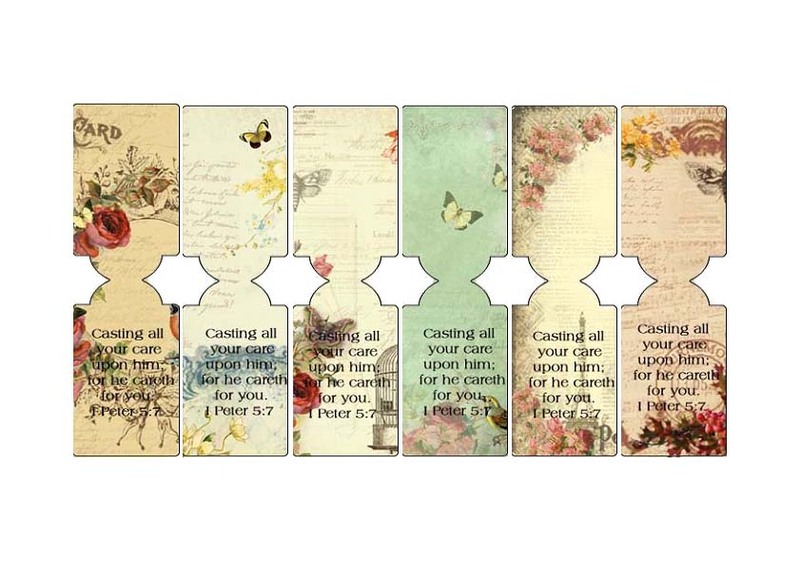 Thanks for sharing them with us in this week's challenge at Word Art Wednesday. Love this cute idea!! And the tags are so sweet. This is a very creative idea. I love the tags that you created as well. Blessings! What a darling idea. Thank you for sharing it. I will need to do this project soon and I'm sure the recipients will love it! These are adorable and sooo realistic-looking! Okay...this is takes the prize! I love cookies, but the whole theme is adorable and has me wanting to host a tea. Oh how very wonderful these are. Thank you so much!